I appreciate your correction and information. I took this image some time ago before I knew the difference. Typo correction: On thc crown worn by him a small buddha figure can be seen representing Amitabha his master. 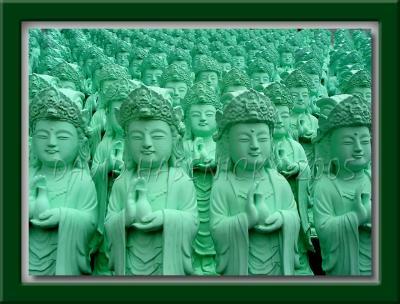 Thank you for sharing your great pics, The ebove pic entitled "Jade Buddhas" are actually not of any buddha but a bodhisattva named avalokitesvara also commonly known as the goddess of mercy or kuan yin to the chinese, or kannon to the japanese. He is one of main bodhisattvas of the Amitabha Buddha's realm. His symbol is the pitcher which he holds in his hand. On the crown worn by him theres a samll buddha is represented symbolising Amtabha his master. Just my small information contribution.